HAVANA, April 12th After the trompe-l’oeil of the Louvre pyramid, the artist JR installed a picture of a boy on a Cuban wall, on the occasion of the Havana Biennial. Two weeks after his impressive trompe-l’œil around the Louvre pyramid, the artist JR has unveiled a new monumental work on the streets of Havana (Cuba): the giant photo of a little boy looking at the above the wall. The artist, known worldwide for his oversized collages, has invested this facade at the invitation of the Italian Lorenzo Fiaschi, director of the galleria Continua, on the occasion of the 13th Havana Biennial, which begins Friday, April 12. In an interview with AFP, the French collector ensures that the idea came to him “very simply”. Because behind this big yellow wall, stand the dilapidated houses of downtown Cuba. He wanted “someone who looks”. Paris Match reports his remarks: “There was this child who was on the balcony (of a neighboring house), and who was watching. He was called, asking him, ‘Are you coming down?’ He was told, ‘Do it like you’re on the wall’. Shot horizontally, the photo of the small cuban neighbor, barefoot, protrudes from the wall. As a call to “continue beyond the wall, to go beyond the wall”. “This image, when it is returned, is the city that is on the side and the child looks to look at all layers,” said the artist to AFP. The work, named Giants peeking the city, is not the first work of the 36-year-old artist on the Cuban island. 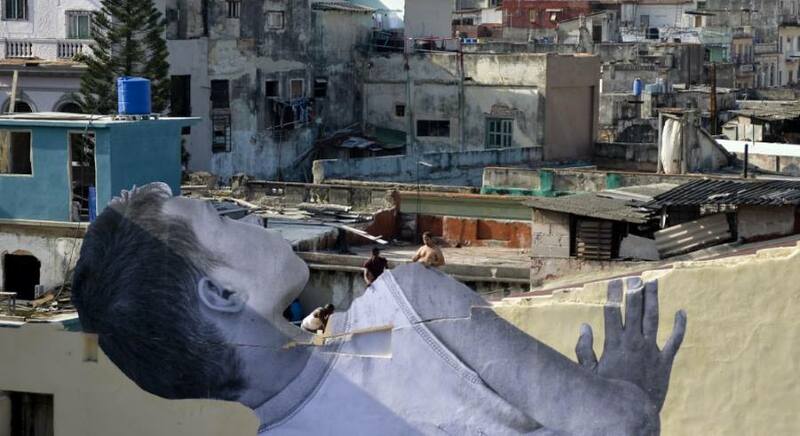 For the 2012 Biennale, JR had pasted portraits of old Cuban people in the streets of Havana for the Wrinkles of the City project. And his artistic adventure in Cuba does not stop there. The street artist prepares a large fresco of Cuban inhabitants, like the one made in Montfermeil (Seine Saint Denis), which will be on display at the Palais de Tokyo in Paris, and San Francisco, and presented next month at the SF MoMa.